Corrections, additions or suggestions for this Historical Names Directory are more than welcome and should be sent by e-mail. Holland’s Lake – Named for James Holland (1821-1896), one of the earliest settlers in the Haliburton area. See History Behind the Site Names by Bill Henderson (59-61, 80) at the bottom of this page. Waconda Point – Good question – does waconda really mean lame chicken in Algonkian? In a Wikipedia article on Waconda Springs, Kansas, it’s claimed that “The name ‘Waconda’ is from the Kanza language, and translates as ‘spirit water’or ‘Great Spirit Spring’.” Kanza refers to the Kaw Nation of American Indians living in the American Midwest. Algonquin Island – Located in Mud Bay, it was named for…. Burnt Bay – Named as a result of a forest fire which had burned much of the shoreline along the bay before we purchased the property in 1946. Kennaway Road – Named for Sir John Kennaway, High Sherriff of Devonshire, who was a Director of the Canadian Land and Emmigration Company which first bought the area to encourage immigration. Rhode Island – This island just off Sejur Heights was named for the 2nd Barrington, Rhode Island troop. The name for Pal Point came from the name of a horse used by Mr. Bill Wilson (50-54? ), who worked for a number of years with JC Moore in the development of HSR in its early years. Pal Point was where the horse would get out of the water onto Buck Island after swimming across the lake from the Hub. Ojibway was named by the Senior Scout Troop of the 133rd Toronto Group. It was originally called “Ojibway Rock”. This Troop’s leader was Mr. Harry Bruce, who is still involved with the Council. I could be wrong with the Troop Number, as Harry has been at different times, leader of both the 133rd and the 77th. Chippewa was named by the Senior Scout Troop of the 73rd Toronto Group. It was originally called “Chippewa Point”. This Troop’s leader was Mr. Howard Harpur, commonly called either “Beans” or “Howie”. This is another story which could be covered at another time. Canoe Point was named as far as I can remember, due to the remains of a Birch Bark Canoe which was found in the waters close to the site. Little Chip was named by the Junior Scout Troop of the 73 rd Toronto Group. It was a Patrol Site for one Patrol when the Troop camped on Chippewa Point. 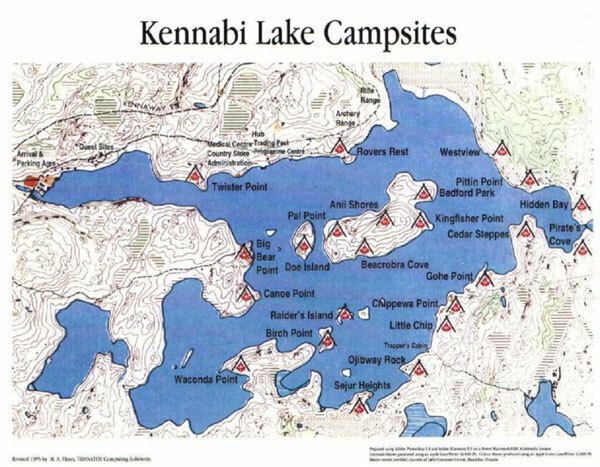 The Troop Scouters camped on the Patrol Site located right at the point, the Kitchen Site was just up from the Dock, and the other Two Patrol Sites were along the shore to the East of the Dock. At the time I was the leader of the 73rd Junior Scout Troop. I am not sure when the first car was put on Turtle Island, but it was done early on in the camp’s history. However, in the late 60’s the Hillman was placed on the Island during the middle of the night. It involved such persons as Ted Aylan-Parker (61, 63-66, 71, 80-85, 90-95), Barry Downs, Paul Gibson, and ably assisted by the Troop on Doe Island from the Bowmanville Training School. As I remember they used a section of the H-Dock, which was being constructed at the time. 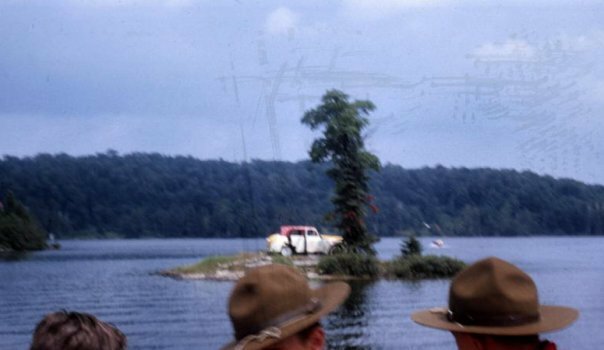 The weekend that the Hillman was moved onto the Island was also the weekend when the Camp Committee had their visit to the Camp. All other details remain sketchy and so far Ted has remained mostly silent. (Now that’s a switch! ).